Asko washers are modern and sophisticated, which means when you have a problem with them, troubleshooting is relatively easy. These washers display error messages for common problems so that you know exactly what is wrong. By reading the error messages carefully, many problems with Asko washers can be fixed at home. 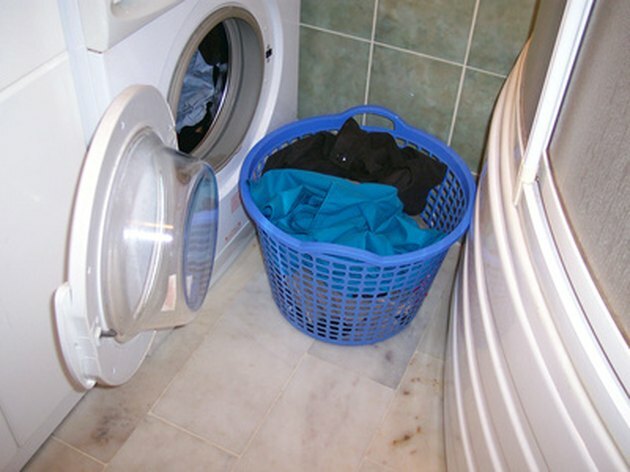 A simple fix may keep your laundry room functioning. Check the power supply and washer door if the Asko washer will not start. Make sure the door is closed. Check the cord, outlet fuses and circuit breaker. Reset the circuit breaker if necessary. Make sure you have not selected the "Delayed Start" program. Choose a different program if you have. If this does not work, call a repair technician or the Asko customer care center. Make sure the power switch is turned on if the Asko washer door will not open. Check power to the unit by completing the previous step. If the door still will not open and the power still does not work, turn off the power switch and unplug the unit. Ensure that there is no water in the drum. Place the emergency door opener that came with your unit in the slot to the right of the door lock. Push it up and down until the door opens. If the door does not open the next time a cycle completes, call the Asko customer care center. Close the washer door if the error message display states that you should. Asko Washer programs cannot be started with the door open. Once the door is closed, the program should start. Turn off the water supply if the error message display states that overfilling has occurred. Contact the customer care center for help. Check the drainage hose of the Asko washer outlet for obstructions if the error message display indicates a drainage problem. Make sure there are no obstructions in the drain pump and that the hose is not kinked. Clean the pump if necessary by opening the drain pump hatch and then unscrewing the pump cover counterclockwise. Remove the cover and filter and pull out any debris from the housing of the pump. Tighten the cover, replace the drainage hose and close the hatch. Run the "Drain" cycle or press the "Door Open" button to empty the machine. Make sure the tap on the water pipe is open if the Asko washer error message shows that there is a water inlet fault. Turn the tap on. If this does not help, turn the tap off and check the water intake filter for any blockages. Unscrew the intake hose and clean the filter inside the intake valve. Screw the hose onto the machine and turn on the tap. Run the wash program of your choice. The error should be fixed. If not, contact customer care. Call the customer care center if the display indicates a door opening or motor fault error or if the previous steps do not help with your problem. Both of these problems will require professional help.